Drivers of the newest version of the Range Rover, using the 3.0-litre TDV6 engine, can go further and faster with the latest addition to the Superchips portfolio. The global engine remap leader has introduced the conversion that adds significant power and torque to the already well-endowed urban off-roader. 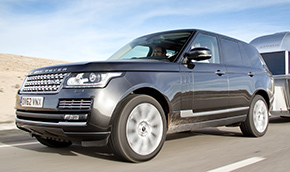 From the factory, the Range Rover TDV6 engine develops 258bhp and 600Nm torque. However, the Superchips conversion increases these figures by 45bhp at 4052rpm and a staggering 115Nm at 1957rpm. The car’s power curves is extended and lifted to provide improved performance while the huge torque increase at less than 2000rpm delivers a significant increase in driveability, both on-road and off. However, the vehicle’s ECU must be Bluefin-enabled before this process can take place, which involves a Superchips dealer removing the ECU. This process is not detectable by service agents and the Bluefin conversion costs £359 including VAT, while the Bluefin-enabling typically costs £60 including VAT, although regional variations may apply.